Navigation systems have the potential to facilitate intraoperative orientation and recognition of anatomical structures. 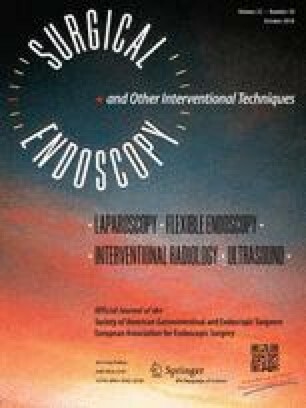 Intraoperative accuracy of navigation in thoracoabdominal surgery depends on soft tissue deformation. We evaluated esophageal motion caused by respiration and pneumoperitoneum in a porcine model for minimally invasive esophagectomy. In ten pigs (20–34 kg) under general anesthesia, gastroscopic hemoclips were applied to the cervical (CE), high (T1), middle (T2), and lower thoracic (T3) level, and to the gastroesophageal junction (GEJ) of the esophagus. Furthermore, skin markers were applied. Three-dimensional (3D) and four-dimensional (4D) computed tomography (CT) scans were acquired before and after creation of pneumoperitoneum. Marker positions and lung volumes were analyzed with open source image segmentation software. Respiratory motion of the esophagus was higher at T3 (7.0 ± 3.3 mm, mean ± SD) and GEJ (6.9 ± 2.8 mm) than on T2 (4.5 ± 1.8 mm), T1 (3.1 ± 1.8 mm), and CE (1.3 ± 1.1 mm). There was significant motion correlation in between the esophageal levels. T1 motion correlated with all other esophagus levels (r = 0.51, p = 0.003). Esophageal motion correlated with ventilation volume (419 ± 148 ml) on T1 (r = 0.29), T2 (r = 0.44), T3 (r = 0.54), and GEJ (r = 0.58) but not on CE (r = − 0.04). Motion correlation of the esophagus with skin markers was moderate to high for T1, T2, T3, GEJ, but not evident for CE. Pneumoperitoneum led to considerable displacement of the esophagus (8.2 ± 3.4 mm) and had a level-specific influence on respiratory motion. The position and motion of the esophagus was considerably influenced by respiration and creation of pneumoperitoneum. Esophageal motion correlated with respiration and skin motion. Possible compensation mechanisms for soft tissue deformation were successfully identified. The porcine model is similar to humans for respiratory esophageal motion and can thus help to develop navigation systems with compensation for soft tissue deformation. Parts of this study were presented at Computer Assisted Radiology and Surgery CARS 2009 in Berlin, European Congress of Radiology ECR 2010 in Vienna, and Computer und Roboterassistierte Chirurgie CURAC 2010 in Düsseldorf. Parts of this manuscript including text, figures, and tables appear in the doctoral thesis of Felix Nickel, M.D., at Heidelberg University Medical School (May 7th 2014) . The current study was conducted within the setting of the Collaborative Research Center 125: “Cognition Guided Surgery,” supported by the German Research Foundation (DFG). We thank Ms. Sarah Trent for proofreading of the manuscript. BPM, FN, HGK, CNG, JN, H-PM: study conception and design, FN, TG, CMS, JN, NA, HGK, JK: acquisition of data, FN, JN, JK: statistical analysis, FN, BPM, H-PM, HGK, JN, JK, TG, CG: analysis and interpretation of data, FN, HGK, JN, CG: drafting of manuscripta, and BPM, H-PM, CNG, TG, CMS: critical revision. The current study was conducted in the setting of Research Group 1126: “Development of New Computer-Based Methods for the Future Workplace in Surgery” funded by the German Research Foundation (DFG). Nathanel Andrews received a stipend from the German Academical Exchange Service (DAAD), and Carly Garrow received a stipend from the Whitaker International Program. Felix Nickel reports receiving travel support for conference participation as well as equipment provided for laparoscopic surgery courses by Karl Storz, Johnson & Johnson, and Covidien/Medtronic. Hannes G. Kenngott, Jochen Neuhaus, Nathanael Andrews, Carly Garrow, Johannes Kast, Christof M. Sommer, Tobias Gehrig, Carsten N Gutt, Hans-Peter Meinzer, and Beat Peter Müller-Stich have no conflict of interest or financial ties to disclose. The study protocol was approved by the German Committee on Animal Care, Regierungspräsidium Karlsruhe, and the Ethics Committee at Heidelberg University Medical School, and written permission to conduct the experiments consistent with official guidelines was obtained for the research protocol (A-19/08). Appropriate care was administered to all the animals according to the National Research Council’s criteria for humane care, covered in the guide for the care and use of laboratory animals prepared by the National Institute of Health (NIH Publication 86–23, revised 1985). All animals were anesthetised during the entirety of the procedure. Once the procedures were complete, each animal was euthenized according to the official protocol with a lethal dose of potassium chloride (KCl) .